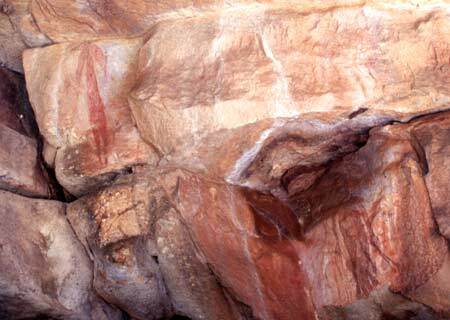 Description Art site is in a small overhang on southern side of Moran River, across the river from Site 2. 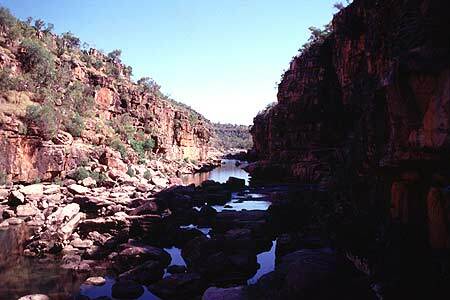 The Moran River in this locality is enclosed in a deep gorge. Some rock scrambling is required to reach the art site. This panel is on a vertical rock wall. The art is poorly preserved. Interpretation The art in this panel comprises two poorly preserved Bradshaw figures. The figure on the left is a red colour and is in plan view from the chest down. The figure’s legs are straight and taper to a point. The feet are not distinguishable. The figure is in profile view from the chest up, as indicated by having both arms on the same side. The arms are reasonably straight and hands are not distinguishable. The figure is looking towards the left and has a long animal-like snout and a headdress that is draped down towards the right. The figure has vertical stripes running down the body from the armpits to the waist. The figure does not appear to have any decorations other than the headdress; it may be what is termed a 'Bland Bradshaw'. The figure to the right of the panel is poorly preserved. It is a mulberry colour. Only the torso and arms are distinguishable. The torso is in plan view. The arms are straight and the arm to the right is holding two straight things with bulges on the end. Fingers are distinguishable on both hands.